Back in its beloved classic format, the Complete Month of Meals Collection is the ultimate cookbook and nutrition guide for people with diabetes, containing hundreds of recipes and meal planning tips from the American Diabetes Association's bestselling series of Month of Meals meal planners. Using a unique, three-part split-page design, this interactive book allows readers to create meal plans instantly by mixing and matching breakfast, lunch, and dinner options. 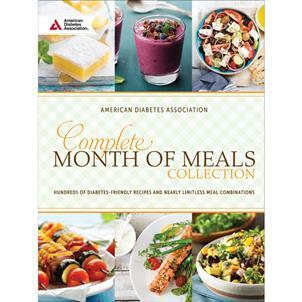 With bonus chapters on salads, sides, drinks, and desserts, the meal combinations are nearly limitless, helping you plan meals that fit YOUR needs: managing your diabetes, achieving your weight loss goals, or adjusting your insulin intake. I ive in Canada (Quebec). The hard covert is the best, the recipe cards for breakfast, lunch and dinner very genius. We can mix and choice rapidly. Completing the old edition. I like both. Il ive in Canada (Quebec). The hard covert is the best, the recipe cards for breakfast, lunch and dinner very genius. We can mix and choice rapidly. Completing the old edition. I like both.